Sitting down to draft a business proposal can seem quite daunting. Use one or more of the three sample proposals provided here to guide your efforts. 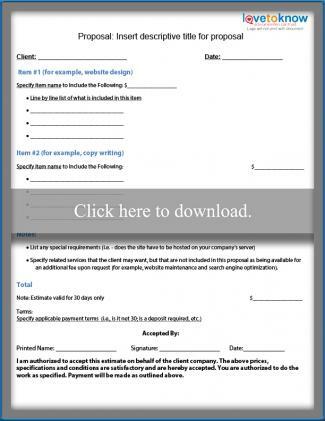 Simply click the image for the option that most closely matches your needs to download the corresponding file. Check these helpful tips if you need help working with these PDF documents. The sample proposal below is designed to serve as a fill-in template that can be used to provide an estimate or quote for a specific project. It includes spaces where you can provide line-by-line descriptions for each included item, along with pricing, special notes, and a spot for your customer to sign indicating acceptance. If you are providing a quote to design and develop a website, this proposal format is a good choice. It can also work well for an employee training proposal, renovation work, and any other projects that are very specific and easy to itemize. The printable document below can be used as a fill-in template for a general services proposal rather than one that is project-specific. 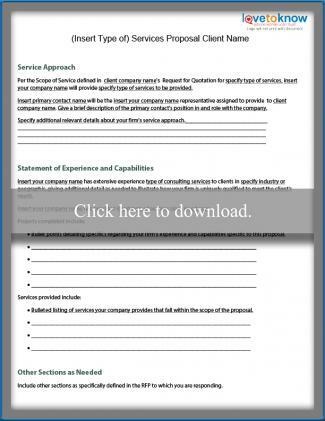 This document provides more detail than the one above regarding client services information, credentials, staffing plans and references. If you are submitting a proposal to provide management consulting services or on-site information technology support, this format is ideal. It will work well for any type of consulting services or relationship-based (rather than project-specific) proposal. This document can also be an appropriate format to use when responding to a request for proposal (RFP), as long as you make certain to include everything specified within the particular RFP you're working on. The sample proposal below is a good template to use if you are providing a proposal focused on selling products to a prospective customer rather than providing services. It focuses on listing and providing prices and details for tangible items. 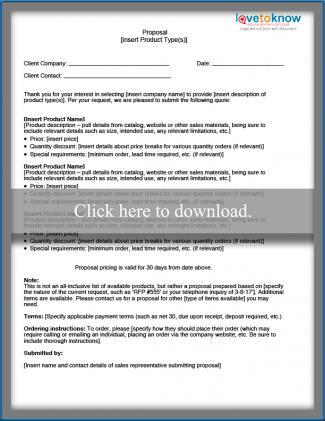 This proposal format is ideal if you are providing a quote based on an inquiry for specific products. It works well for all kinds of products, from industrial equipment to office supplies. Any business proposal you create must be specific to your company, the needs of your customer and the nature of the work or items for which you are providing a quote. Drafting a proposal becomes much more manageable when you start from a sample document rather than a blank screen. Base the format and design of your own letters using one of the templates above and you'll be well on your way.